One tiny flaw, and 50 years lost! Imagine waking up every morning having aged five days while you slept. In about 13 years, you would come to the end of your life. There is a children’s disease with similar effects, called Hutchinson-Gilford progeria syndrome (HGPS). A single point mutation in the DNA causes progeria—just one flaw.2,3 This defect is a sobering reminder about the importance of the amazing ability of the human DNA strand to reproduce itself virtually error-free. Our DNA has a total of three billion base pairs, or ‘letters’, designed by God to build an entire human body. The DNA contains genes, which in turn are made up of an almost infinitely varied sequence of four molecules—cytosine (C), thymine (T), guanine (G) and adenine (A). Genes code for particular proteins such as keratin, which comprises our hair, or the amylase enzyme in your saliva that is digesting the starch you ate recently. A typical gene has a total of a thousand or more of the four ‘letters’, C, T, G and A. According to the head of the Nation­al Human Genome Research Institute (USA), a single misplaced ‘letter’ on the gene, which is known as Lamin A, or LMNA, causes progeria.4 A letter ‘T’ has replaced a ‘C’. In other words, the substitution of one thymine with one cytosine in one specific gene results in a horrible disease that prematurely ages children. This single mistake indicates how finely tuned the DNA really is. This terrible disease, which causes children to suffer, and drastically shortens their lifespans, reminds us of the Curse that we all struggle with in today’s world—the Curse of death and decay because of mankind’s sin. Genesis 3 tells us about the origin of sin, death and struggle for survival. Romans 8:18–25 speaks to the suffering we now experience, and how the whole creation groans because of the Fall. This reminds us also of our need for the Saviour, Jesus Christ, to rescue us from our lost, fallen state. In Him we can have present hope and confidence regarding our future. Seeing how only one mismatch can have such horrendous consequences, how can mutations be the means by which new kinds of life form? Humans supposedly evolved from a common ancestor with chimps. But humans and chimps differ by over 150 million DNA ‘letters’.6 How could mutations account for such a difference? The information explosion in our understanding of the wonders of DNA reveals the incredible glory of our Creator. He deserves the glory for designing the amazing DNA structures. But the dreadful effects of mutations on DNA in this sin-cursed world remind us of our dependence on Him for life. Tiny defect behind rapid-aging disease, <seattlepi.nwsource.com/national/117861_medi17.html>, 2 September 2003. Return to text. Eriksson, M. et al., Recurrent de novo point mutations in lamin A cause Hutchinson–Gilford progeria syndrome, Nature 423(6937):293–298, 15 May 2003. Return to text. Researchers identify gene for premature aging disorder, <www.nih.gov/news/pr/apr2003/nhgri-16.htm>, 2 September 2003. Return to text. Recer, P., Gene found for aging disease in children, Associated Press, <www.kansas.com/mld/kansas/news/politics/5649319.htm>, 4 September 2003. Return to text. See Wieland, C., Living for 900 years, Creation 20(4):10–13, 1998. Return to text. See DeWitt, D.A., Greater than 98% chimp/human DNA similarity? Not any more. Return to text. 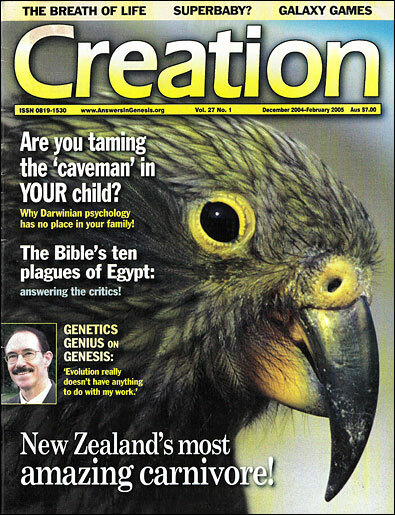 See Wieland, C., The evolution train’s a-comin’, Creation 24(2):16–19, 2002. Return to text.